Can anyone help me identify the IC's on this layout? Itching to get etching! I have looked at the schematics referred to but they are the basis from which Vladosh has tailored the circuit himself. Are these LM13700 and TL074? Hello and thanks so much for getting back to me. I have etched an MFOS dual VCA and will be populating it soon. Do you have a simple way to make it into a Xfader? Will have a look for the Xfader on your blog. If I expect some bleed through it will be ok.
For adding crossfade, The EFM crossfader may work, out of the wildcat. I haven't tried to build this but the circuit looks simple enough. Scroll down to Cross mix-inverter. Thanks for the tip having a look at Fonik link now. Looks good, nice and simple from the parts layout. But there is no schematic or foil layout. Do you know where I can find one pls? 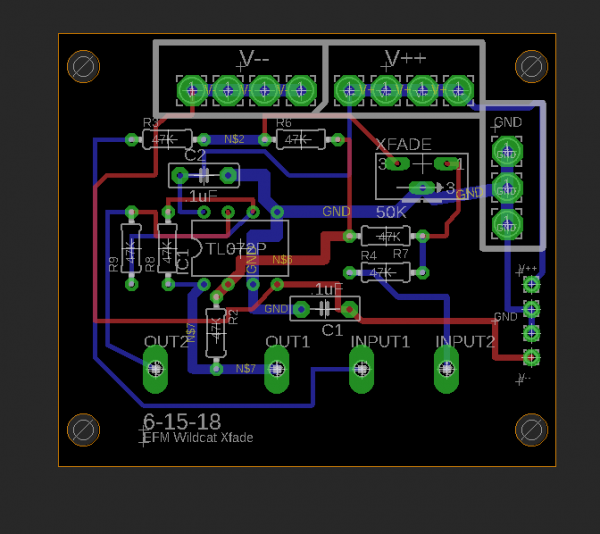 CL: I'll create a board/schemo/gerber using eagle and post it soon, but I don't think I'll have time to test it any time soon since I am working on a bunch of other things right now. If you want, take the gerber and send it off to easy EDA, it would cost maybe $30 for 10 boards. 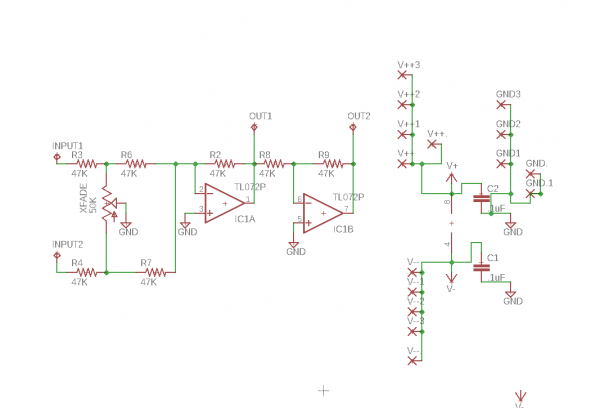 To me that's easier/cheaper than spending a day breadboarding or using perf. Hi again, I whipped up an eagle design for this. As I said, it's not tested, but this is one of those "I can't see why it won't work" situations. The ZIP file contains eagle 9.x brd and schem and the gerbers. If anyone actually prints up the gerbers let me know if it works and I can make adjustments. I may run this the next time I do an easyeda run (it'd be $5 for 10 boards...) and if I get it working I'll post. 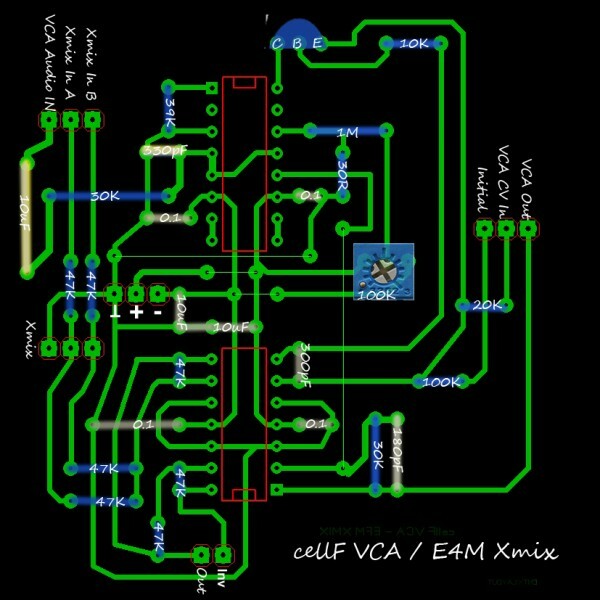 About the quickee layout: The xfade pot is 50K linear and to make this faster to conjure up in eagle I used a trimmer package, but you won't want to use a trimmer in real life, instead please solder your 3 pot wires to there (or you could wire in a VCA that passes DC if you want to "automate" this). 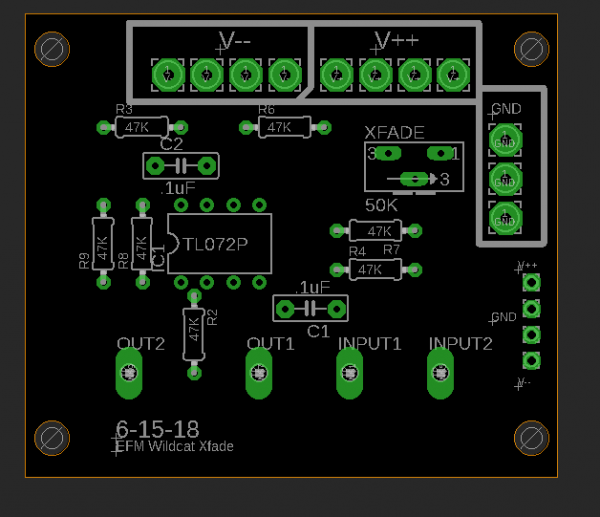 I could also do an eagle variation that uses a PCB mounted pot (you can get these cheap from small bear but it assumes certain front panel space requirements that may not work for you) if there is interest. 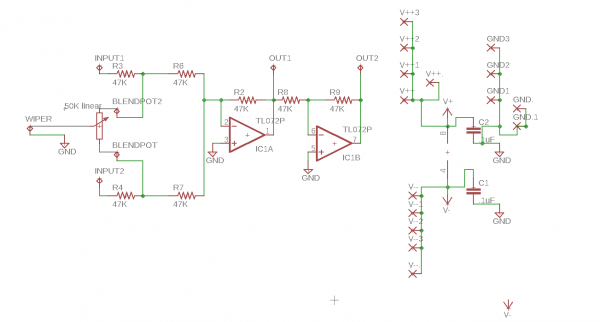 I image all the 47K resistors and 50K can be any value but should all be matched to at least 2% or better except the pot. Just a guess. I include eagle sch and brd files. brd and sch Eagle 9.x files for single sided xfade board. Based on EFM wildcat crossfader. Untested. Yes I would like to try and make the g.gabbi crossfader, thank you g.gabbi! I will be running the Xfader on +/-12V do you think those resistor values would be ok? that means u try out my idea? and report back if it is working? 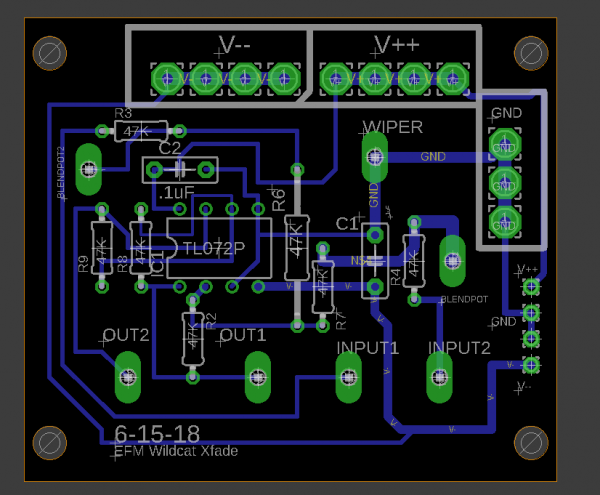 and then i make a little pcb for it? 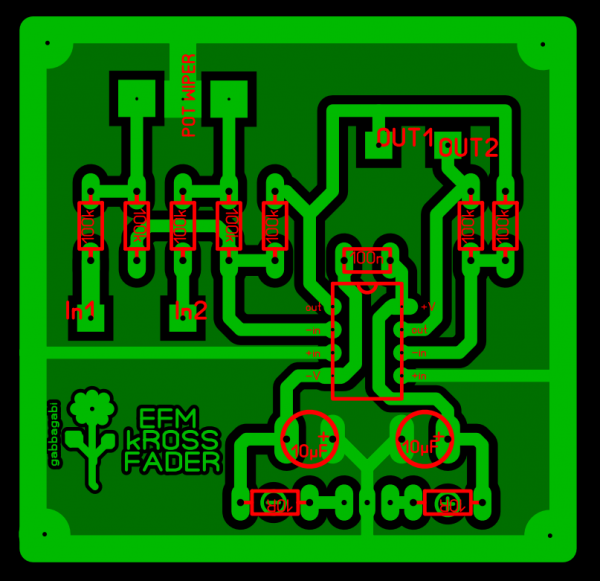 or u will try out the pcb of the efm xFader? both will run smoothly on 12V. I can try out both. I think crossfading is a useful functionality. And yes I will let you know how it goes. Thank you. please make double shure that i have done the mirroring right.